I am an educator, researcher and writer, passionate about storytelling and its power to change perspectives of self. Through undertaking the journey of my own transformative learning, I now work with adults to support them in drawing forth stories of the strength and potential gained in their lives, as they move towards the creation of their stories as yet untold. My three beautiful adult boys are the most precious part of my story, and continue to walk with and support me in undertaking my PhD research about storytelling and the learning of our lives. I write about story and transformative learning ... the circumstances of our lives and the stories remembered; influences on the construction of our self-identities - positive and negative; critiquing the assumptions and limitations we have come to accept about ourselves, our potential, and our place in life; daring to imagine a story untold. Good morning all my lovelies. 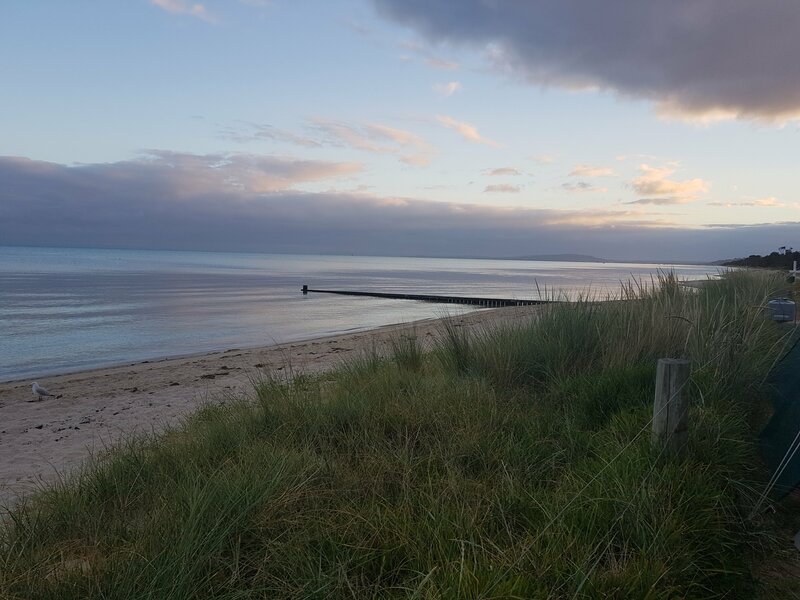 The day dawns quietly here on the Mornington Peninsula, and I am mindful of my family and friends near and far across the seas. On this day that celebrates new life and hope, I send out to each of you my love and gratitude for the many gifts you bring to my life. Some of us see each other daily, and for many of us, the experience of life keep us physically apart. For some this season heightens awareness of painful transitions in life, and for those who are experiencing such challenging times, please know that my love is with you, and that you are in my heart. However (whether or not) you choose to honour and celebrate this season, my blessings to you and yours, and my wish that you will find peace, joy and contentment in each moment for life as it is. I am in the midst of bringing my thesis to life… drawing together and making sense of the collage of sometimes disparate discoveries and ruminations on theorising and practicing education. I am most interested in identifying the conditions that foster transformed perspectives on life, living and learning, in this case within the learning spaces of teacher professional development in Vocational Education and Training (VET). I have been fortunate to find myself supported by a wise coach (and dear friend) who is helping me navigate the ‘road home’ for my thesis. We have been exploring the key values that underpin this journey to completion, and have both been intrigued by my resistances to certain terms… ‘structure’ and ‘discipline’ to name two. We are exploring the origins of my seemingly irrational response to their inclusion in my positive language bank, and considering ways I might reframe my perception of their value. The problem is not so much about choosing between one or the other. The issue would be rather to learn how to regulate between openness and closure, instantaneity and duration, excitement and boredom, etc. Those are interesting “motifs de dualité” (Bachelard, 1950) that are constitutive of the everyday rhythms of our lives (sometimes we feel the need to be connected or stimulated, other times we prefer to remain on our own or quiet). So interestingly, as I contemplate these resistances to ‘structure’ and ‘discipline’, I find myself returning to the roots of my original inquiry, commenced over a decade ago. Whether I consider the tensions inherent in deciding whether to be present and active in social media as an academic; the process of supporting my learners as they unpack and critique their uncontested assumptions, or the impact of the structure and discipline required to be productive and successful in my goal of completing my thesis… I have deepest knowing that fertile space must always be available for the dreaming and emergence of creativity, self-expression and previously unimagined possibilities. Fertile space inhabited by Kairos time, where ‘the coming into being of a new state’ is able to unfold. A path on which to travel. Alhadeff-Jones, M. (2017a). Time and the rhythms of emancipatory education. Rethinking the temporal complexity of self and society. London: Routledge. Jaques, E. (1982). The form of time. New York: Crane, Russak. Miles, J. K. 2010 Restor(y)ing lives: Autobiographical reflection and perspective transformation in adults returning to study. (Master’s thesis) Monash University. Clayton. Peck, S. M. (1978). The road less travelled. New York: Touchstone. Ramo, H. (1999). An Aristotelian Human Time-Space Manifold: From Chronochora to Kairotopos. Time & Society, 8(2-3), 309-328. Ramírez, J. L. (1995). Skapande Mening: En begreppsgenealogisk undersökning om rationalitet, vetenskap och planering [Creative Meaning: A Contribution to a Human-Scientific Theory of Action]. Stockholm: NORDPLAN. Rogers, C. R. (1961). On becoming a person; a therapist’s view of psychotherapy. New York: University of Chicago Press. Simpson, J. A., Weiner, E. S. C. (1989). The Oxford English dictionary (2nd ed.). Oxford and New York: Clarendon Press; Oxford University Press. Smith, J. E. (1969). Time, times and the ‘right time’. The Monist, 53(1), 1-13. I’m into the seventh week of my family’s annual beachside holiday on the beautiful Mornington Peninsula. Every year we come down to immerse ourselves in the soothing, natural delights offered by seaside living. Endless, changing vistas of magnificent skies and calming seas provide soul-healing space for us all. Traditionally, in previous years I have luxuriated in a daily early-morning swim in these divine waters to reconnect myself to nature, however this year has found me struggling to relinquish the warmth provided by my bed in favour of the invigorating seas. I am also here in this peaceful place to bring my PhD thesis to its conclusion. I have managed to set aside a significant time period to achieve this, and have found myself more focused on paying greater attention to the need to sit down and commit to my writing. Even for this though, I have on many occasions curled up on my bed and allowed myself the luxury of immersion in the inner world of my thoughts. Today is different. As I awoke to the sound of the seas lapping on the shore, I checked my emails to find this commentary from Heather Plett. Just as I did when reading her article ‘Waking up is hard to do‘ (see also the link within this to ‘Holding space’), in ‘Trauma and Trump’ I found incredibly powerful words that connected deeply and provided me with a sense of profound personal meaning related to my response to Trump, and to others who have behaved towards me in ways that are cruel, dismissive and lacking in emotional intelligence. Heather speaks, amongst many other things, about the somatic response of trauma and grief we experience and the ways our bodies unconsciously react to deeply disorienting situations. Her words stirred me intensely, and I suddenly found myself longing to step into the comfort of the sea, to feel her soothing balm on my skin, to luxuriate in her embrace. So while most of my fellow seaside companions were still slumbering, I returned to the sea for my early morning swim. I have much sense still to make of this, but it has affirmed, most significantly at this point, the emotional and physical connections we have… across our own times and across generations… and the ways in which these past experiences inform our present realities. In response to the cognitive understanding of my past emotional and physical reactions, my body yearned to reclaim its power, to counter the unconsciously expressed trauma and grief, experienced through an act of reconnecting with healing rituals. It also reminded me that we are always in a state of becoming… we are always learning and unlearning our ways of being in the world. Heather’s words spoke to me at a very deep level and uncovered personal revelations. Her may not connect with you, but I encourage to have a read to see if her thoughts stir anything for you. Thankyou for visiting my page. I have lots of stories to share with you about life and living - about the journey of stretching and growing, and the transformative power of learning as we morph into the greatest version of ourselves. You are fierce with reality.